Flames of pain rushed through Rahab. Her arms and legs pleaded to be moved to relieve their stiffness. She tried to lift her head, but felt a sudden wave of sickness come up from her stomach. Managing to turn her head just in time, she threw up her last meal of stew. Rahab twisted away to avoid staring at the dark puddle which colored the sandy street beside her. The cool night in Jericho should have provided easier breathing compared to the heat of the day. But Rahab had trouble breathing from the weight pressing down on her chest. She took a slow steady breath. A loud crash startled Rahab. Forcing her eyes open as wide as she could make them, she searched for the source of the noise. No one was around, but she was sure she had heard something. Rahab noticed movement about a stone’s throw away from where she lay. She opened her mouth to scream, but was surprised at the sound which came gurgling up from her throat. It was low and broken, and reminded Rahab of a wounded animal suffering at the hands of an unskilled hunter. Her lips burned with fire as if she had been wandering in the desert for days without a drop of water. As Rahab lay there trying to find another way to get the person's attention, the flutter of activity drew closer toward her. A surge of fear rose up her back. Something was wrong and her instinct was viciously trying to warn her of danger. She strained to move. Agony roared forward like waves crashing on the banks of the Jordan River. A shape slowly came into focus through the meager slits through which Rahab now saw her world. Misshapen proportions gave indication the being was not only not human, it wasn’t natural. Rusty skin of peeling layers covered by small spikes of metal formed a slinky animal Rahab could not recall from her memory. It moved with hesitation toward her. All four legs were of slightly differing lengths, but it seemed to favor the back two for walking while the front two scraped the ground. Eyes of red stared at Rahab's as it edged ever closer. Fighting the increasing pain to hold her eyes open, Rahab searched the creature for a sliver of humanity. She came up empty handed. If her legs were in working order, Rahab knew she would have been running. The small beast came close enough to sniff Rahab's head as she closed her eyes tight and waited for the thing to rip into her already aching flesh. She could hear the deep inhales closing in around her ears. She could feel its hot exhales on her forehead. After one last huff, the creature let out a deafening cackle beside Rahab's left ear. She opened her eyes expecting to see the ugly face of the being staring down as her. To her surprise, it ran around in a circle beside her like a wild dog chasing its tail. It was still laughing. Fear turned to anger as Rahab wanted nothing more than to kick the strange creature. “Stupid human,” the thing said, before it disappeared behind a nearby building. Rahab's bottom jaw hung open. The sound of the disgusting creature talking triggered a flash of images in her mind. She had seen something like it before. Faces rushed to her mind as Rahab recalled the events of the day. Earlier that morning, she had been with her family enjoying the first meal of the day in their simple home. Rahab helped her mother clean up the dishes and gotten her younger brother, Noda, washed and ready for a nap. Rahab began to sing a simple song to herself while she swept. “Rahab, come in here.” Her father’s deep voice bellowed from the other side of the dark blue curtain which divided the large room. She dropped the stick broom and rushed to him. Though Tzuri should have been gone for the day, Rahab didn’t hesitate even for a moment when she heard her father call. “There you are,” he said, sitting in front of their small family altar to Astarte. His massive frame hid most of the altar from Rahab’s view. Tzuri was a strong man and had seen much in his life. He worked with his hands and spoke little to anyone. Commands, along with any other interactions, were short and direct. He was a man who knew what he wanted and expected his family to fall in line behind him without question. Rahab could tell he had been deep in prayer to their goddess. The small oil lamp on the altar was lit. She could also see fresh flowers and food had been set around the small statue. Rahab nodded and bowed deep. Tzuri waved her off from his presence. She picked up her broom and returned it to its place in the kitchen. Snatching a freshly cut flower from the table, Rahab ran outside to enjoy some fresh air. Passing a street shrine, Rahab stopped to place the bright red pomegranate flower on the pile of offerings. “Soon I’ll be able to give so much more. Bless me, Astarte,” she prayed. “Help me be a faithful woman and bear many children,” she said, with a deep bow to the statue. Familiar laughter behind her caught Rahab’s attention. She turned around to see a group of friends playing. Two boys chuckled to each other. “My father made my plans last year,” one of the girls teased. Rahab folded her arms across her chest. “I think is it nice, Rahab,” Gitel said. “Come, we’re playing.” She pulled on Rahab's folded arms. Wanting to be included in the game, she did as he asked. “Grab her,” the boy screamed with glee. Some of the children picked up Rahab as she tried to lie still. They carried her through the streets of Jericho. Another walked solemnly behind him, pretending to pray as he had seen the hooded men do during a real funeral procession. The games went on as the sun crawled across the sky until it reached the distant mountains and hid behind them. “I think I better go home now,” Rahab called to Gitel. “See you tomorrow,” the young girl said as she waved to her friend and turned the corner with her older brother. Rahab began to walk home. As she rounded a corner, she realized it was unfamiliar. Doubling back the way she had come, Rahab didn’t see anything she recognized. She ambled up and down a few more streets to try to find her way in Jericho. As darkness closed in, she could feel her heart start to beat faster as her breath quickened. If I can find the temple fire, maybe I can find my way home. All the stone buildings looked the same and each time she rounded a corner, the empty streets only taunted her with similarities. Pressing herself up against a nearby wall, Rahab looked around to find a face she could trust. Though she could not see anyone, Rahab heard faint voices coming up the street. “What now? I'm so bored,” the first voice said. “Let's see what else is around this city. Night has fallen and I’m sure we could find something to entertain us,” a second voice called. Rahab felt the hair on the back of her neck stand straight on end. Everything inside of her told her to run, but she was desperate to find help. She took a cautious step closer to the edge of the building and peeked around the corner. Rahab covered her mouth to stifle a scream which threatened to erupt as she pulled her body back into the shadows. Walking down the street were two large creatures that didn’t belong in her world. The first stood as tall as the double building he walked past. Horns poked out of every open place on his body. His skin was as red as a flame and his large eyes were set deep in his head. They were the darkest black Rahab had ever seen. Large pointed teeth stuck out of the creature's mouth in all directions. One of his arms was longer than the other, but the shorter arm was stouter. He walked with a slow gait, and moved his head from side to side as an animal hunting its prey. The second creature, equal in size, was covered with thin blades like those of a sickle. His skin was white with black splotches and large bumps. He had only one eye. Where the other should have been, a large curled claw stuck out of his head with the tip broken off. “What are those things?” Rahab whispered to herself. “Goddess Astarte, hear your servant's plea. Give my feet wings to flee. Protect me, I pray.” Rahab opened her eyes to find herself still pressed against the side of the building. Astarte didn’t hear her faint cries for help and Rahab could hear the hideous creatures coming closer. “Where are all the men?” One of the beasts whined. “I'm sure some will be along. This town is full of them,” the other laughed. The sound mixed with its echo off the stone walls. It was so loud that Rahab had to cover her ears until his laugh died down. As her heart pounded faster, Rahab noticed two men rounding the corner of a nearby building. They were headed straight for the giant beasts. Be careful. Why don't you see those awful creatures? Rahab screamed in her mind at the two men while she pressed herself harder against the wall. She was terrified that the creatures would see her. The two men passed her without a backward glance. Rahab peered around the corner and watched the men walk right through the creatures' massive legs. The eyes of each beast followed the men over their shoulders. They shared an evil glance with each other. “They will do,” the red one said. Nodding his head, the white one extended his claw-like fingers and reached down to dig into the ground. He arched his back high into the air and let an ear-piercing howl escape from his drooling mouth. Rahab pressed her hands over her ears, but they were already ringing from the noise. The red creature pounded his chest before taking off at full sprint. Each creature reached his target at the exact same moment. They grabbed the heads of the two men to keep them from screaming. They were successful in not allowing a single sound to escape from the men’s mouths. Unfolding the muscles and flesh of the two, the creatures carefully ripped the bodies in half while they shrank in size to crawl inside the humans. Each disappeared completely into their covers and shook out their newly acquired limbs. “I'll say,” the other agreed, shaking his head to clear out the fog. The men cackled while they poked and punched at each other. In the moments of mesmerizing fear, Rahab had left the safety of the building. She found herself standing in the middle of the street staring wide-eyed at the two possessed men. The other man turned to see the girl frozen in horror. “Do you think she saw us?” he asked under his breath. “Looks like she did,” he whispered to his partner. The other nodded, but kept his eyes on Rahab. “Don't be afraid, young one. We mean you no harm,” the first one lied. The two came close to Rahab and slithered around her like snakes surrounding a meal. “What are you called?” The second man asked. Closing her eyes, Rahab hoped at any moment she would wake up from this nightmare and be safe in her home. Help me, please! Astarte, where are you? Warm tears streamed down her cheeks. She felt her knees begin to shake. When she opened her eyes, the two men were looking down at her with empty stares. “Boo!” The first man yelled. His nose almost touched hers. A chill ran down Rahab’s back at his cold touch. “We must hurry. We don't have much longer in these bodies,” the other said. His body twitched. 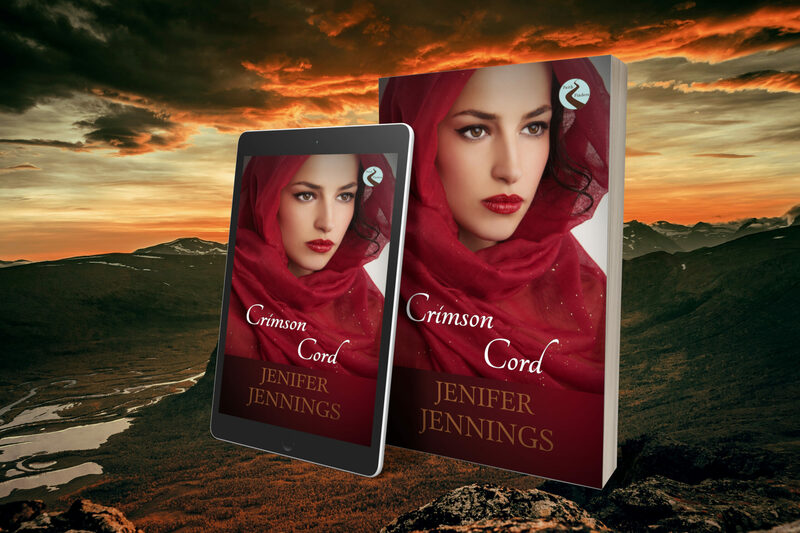 “Are you thinking what I'm thinking?” the man asked, as he wrapped Rahab's hair tighter around his fingers until his hand made a fist. He pulled her frightened body close to his. Each grabbed one of Rahab's arms as they dragged her behind the building where she had been hiding. They began to rip at her clothes. “Astarte!” Rahab shrieked as she pulled against their strength. 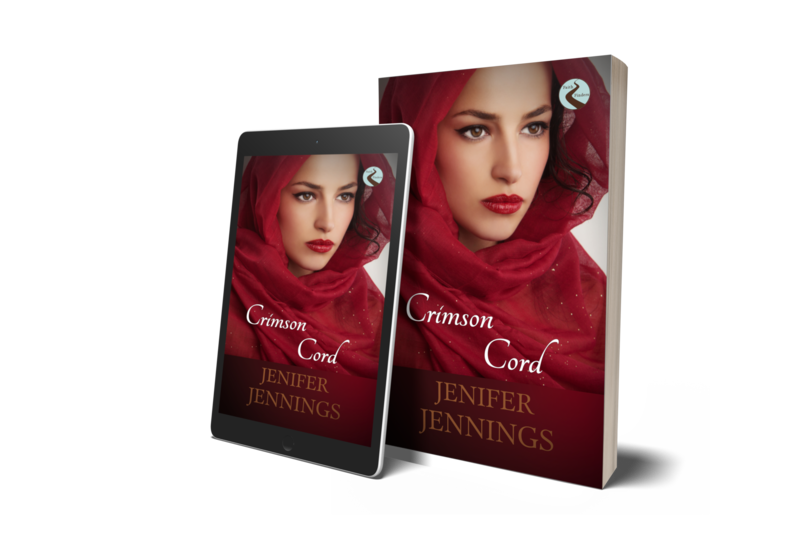 ​Pick up your copy of Crimson Cord for $3.99 eBook or $12.99 paperback. Join Rahab in her journey.